For your business to run smoothly from day-to-day there is nothing more vital than reliable security. At Atlas UK Security we are delighted to offer you our cost-effective key holding and alarm response solution to relieve the pressure of organising key holders within your business. With this efficient service you can rest assured that our SIA licensed guards will provide a reliable solution, rapidly responding to any alarm call to ensure the absolute safety of your premises and immediately alerting the police if there are any signs of criminal activity. Without appropriate alarm response solutions, you are leaving your premises severely open to crime that could not only leave you out of pocket but your staff at risk too. Ease the stress of choosing key holders within your company today and hire Atlas UK Security’s key holding services and alarm response to make sure your company is not the victim of unnecessary crime. Although 90% of all alarm activations are non-threatening, there is no more unpleasant task for an employee/neighbour than to be called out in the middle of the night. We are a BS7984 approved Security Company, this means that our system for securing your keys and alarm information meet the highest standard possible. We will issue you with 24hr emergency contact telephone number to give to your monitoring company or update your auto-dialler and in the event of an alarm being tripped either by fault or by an intruder, the monitoring company would contact us to attend the site. The Atlas UK fleet of liveried vehicles and team of vetted and licensed Officers are supported by our 24hr operations centre, providing rapid response and local management support. Once on site a full inspection will then be made. In the case of a break in we will remain on site until the premises can be secured. The Police will be called if necessary and we will arrange for any broken windows etc. to be boarded up. One of our management team will attend the site and liaise with the police for crime numbers and statements if our clients are unobtainable. Police National Response Time is now 3 hours: Due to changes in the way police respond to alarm systems many companies are requesting manned guard response from day one of the installation of new alarm systems. Atlas UK Security are happy to liaise with alarm companies to ensure the smooth operation of key holder duties to both new and already installed alarm systems. Upon an Alarm Activation, one of our experienced Response Officers will attend your alarm and carry out a full inspection before resetting the alarm and securing the premises, if it was a false alarm. Our average response time is now at 22 minutes which we try to improve on daily. Each and every activation will be documented and emailed to you the following morning for your perusal. You will receive a full report each time we attend, including what time we arrived, what was found, any actions taken on your behalf and what time we left the site. We will then contact you to follow up on the report and ensure you are not using our Response Service unnecessarily due to human error or faulty/temperamental alarm systems. If there is an incident/fault that requires immediate action the Response Officer will contact one of your named key holders to notify them of the situation, assisting in any subsequent action. If damage has occurred or repairs are immediately required, we can enlist one of our/your approved contractors to carry these out without the need for you to attend at that time. Our Mobile Patrol Units will respond to alarm activations during closed periods, meaning there is no risk to you or your staff when called out to attend the premises late at night. Your Health & Safety and Insurance requirements are met. You will have peace of mind that your keys, premises and staff are safe. The disruption to your business when break-ins occur is the absolute minimum. 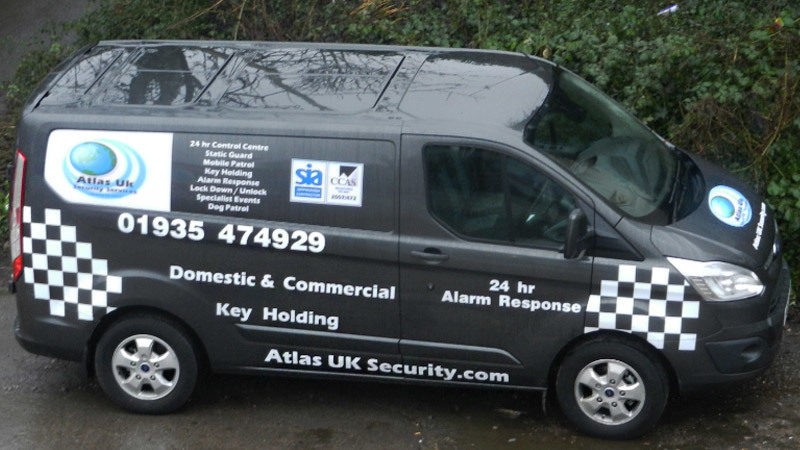 Atlas UK Security Services…. THE Quality Solution!